Although I count myself among those who still enjoy pulling a book off of a shelf and reading through it, modern Bible software has taken Bible study to a whole new level. Among the Bible software programs available today, none is more comprehensive and powerful than Logos 5. If you’re wondering how Bible software can assist you in the study of God’s Word, here is a 2 minute video from Logos that may whet your appetite: https://www.logos.com/logos-5. I have been a Logos user for over 11 years and whether I am doing personal devotions, preparing to teach a class, or writing a book, I have found it extremely helpful. 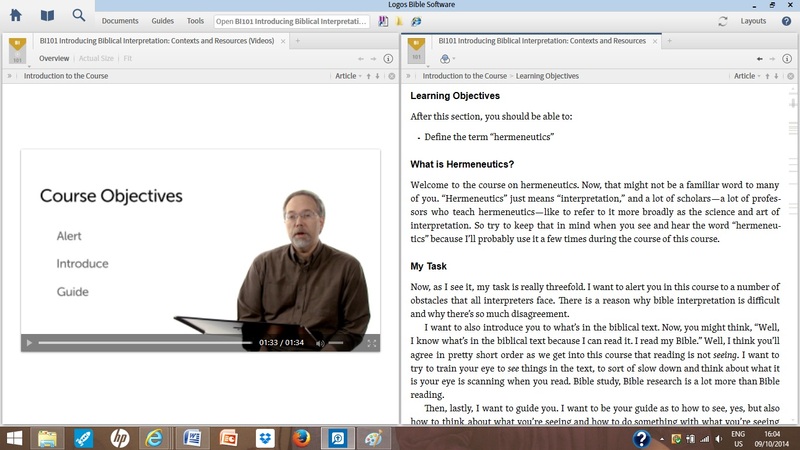 Logos Mobile Ed Course: Introducing Biblical Interpretation. For a look at this resource in Logos, click anywhere on this link. Besides all of the great Bible study tools available, Logos has recently inaugurated a series of courses taught by knowledgeable and experienced instructors called “Logos Mobile Ed Courses.” These courses cover everything from Introductions to the Old and New Testaments, to various biblical books, as well as topical courses on apologetics, pastoral counselling, and many more. For a complete listing of available courses, click on this link (Logos Mobile Ed Courses). These courses can be downloaded to your Logos Bible study library and are then available for you to explore at your own pace. I have recently received the Logos Mobile Ed course entitled: Introducing Biblical Interpretation taught by Dr. Michael S. Heiser, the academic editor of Logos Bible Software. In this review I will introduce you to the format of the Logos Mobile Ed courses, as well as provide an outline and critique of Introducing Biblical Interpretation. In future reviews, I will look at the course material in more depth. A typical view of the Logos Mobile Ed course screens with video on the left and text on the right. Looking at the photo above, you can recognize two features about the video. First, each video clip is very short, lasting anywhere from 1 1/2 minutes to 4 or 5 minutes. This is very helpful, as the instructor breaks the material down into small bite-sized chunks. It also makes it easier for you to go at your own pace. If you want to cover an hour’s worth of material, you can; but if you only have a few minutes, you can still sit down and go through a couple of videos. Short videos also provide motivation. If I realize that I have to block out a longer period of time, I’m less likely to open the resource, and consequently, it will take me longer to make it through the course. A longer video also makes it more difficult to find the place you’re looking for. For example, if you only have time to watch about 10 minutes worth of material but the video is 30 minutes long, you will have to click through the video to find your place later on. Similarly, as a teacher, if I am wanting to use a particular video to show my class, it is much nicer to have a concise presentation of a particular point, rather than having to search through the video for the exact beginning and ending point. Speaking of finding your place, another helpful feature of the Logos Mobile Ed courses is that they reopen in the same place that you close them. So you can watch several videos, close the program and when you return it will open to the exact same spot. A second feature of the video is the plain white background. My initial reaction was that this seemed a bit Spartan. Why not spruce up the background with a plant or something? But the more I thought about it, the more I realized that Logos has chosen a more productive approach. First, it allows plenty of space for putting up main ideas, which is another nice feature of the video lectures. Second, it makes for a nice clean presentation without a lot of clutter to distract. Third, background tastes change over time. The simpler, the better. Having come around to Logos’s way of thinking on this, I would still offer one suggestion: People who struggle with dyslexia and other learning disabilities frequently have more trouble with black type on white backgrounds. Logos should keep the background plain, but I would suggest using a different color to make reading easier. While we are talking about the videos, I have had one problem with this particular course. Every video I watch jumps about, similar to the effect of someone poorly editing a piece of film. I thought this might be my internet connection (even though the program is loaded on my hard drive), so I have tried watching the videos both at home, and at the office. However the result was the same. Next, I downloaded all of the videos to a separate folder (not an easy task!) so that I could pull them up apart from the program. This time the videos seemed to work perfectly. This has left me a bit confused as to where the problem lies. My colleague, who has another Logos Mobile Ed course, has had no such problem with his program. So I don’t know whether the problem is with this particular course, or my particular download of this course, or some other factor. I would be interested to know if other Logos users have experienced a similar problem with this course. This course provides an introduction to the science and art of Bible interpretation, focusing on the importance of interpreting the Bible in its original ancient contexts. These contexts include the biblical writers’ ancient worldview, their historical circumstances, cultural and religious beliefs, the attitudes of their day, literary genre, and the original languages of the Bible. The course aims to foster an awareness of these contexts, all of which require competence for correct interpretation. Students are introduced to tools for developing competence in all these areas. Units 3 and 4 contain the largest amount of material. These units are interrupted by quizzes and a midterm and final exam. Thus, you have an opportunity to test yourself and see what you have learned. Next time I will take a closer look at the contents of this course. 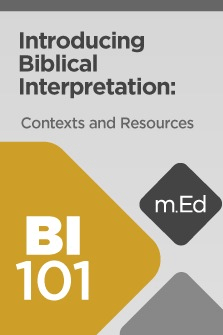 To check out the Logos Mobile Ed course, Introducing Biblical Interpretation: Contexts and Resources, click anywhere on this link. Are New Testament Manuscripts Reliable? Hey Randy, great review! I look forward to seeing your thoughts (although, I could just ask you from your desk!). Great point about black text on white background, I hadn’t thought of that. I suspect that your videos are lagging within Logos because it’s quite a heavy piece of software for your laptop to handle, while individual video software can be less so. Does Logos itself ever lag? Thanks for your response. It does take awhile for Logos to open because of the size of my library, and when I’m going to certain screens such as my “layout” screen, it can take awhile. So perhaps that has something to do with the videos lagging. Thanks!